Today, WNSOs member manish is celebrating his/her Birth Day !! WNSO wish to you is that today, have a very good day, and to be remembering day in the days to come. And will be very happy more than in the beginning. May all your sweet dreams come true on your very special day. The whole WNSO Team wishing you on your birth day for your very good future in the days ahead. Many many happy returns of the day, Happy Birth-Day to you. Cheers on your Birth Day!! 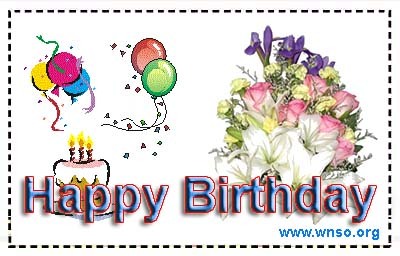 Today, WNSOs member Pooja sahni n dineshkarki are celebrating their Birth Day !! Edited by RawalSB, 11 November 2003 - 09:36 AM. Today, WNSOs member Mallabhavana ji is celebrating her Birth Day !! WNSO Team wish you a very happy Birth day. May all your sweet dreams come true on your Birth Day and may have your Birth day cheerful, joyful and colorful.....have a lots of enjoy on your Birth day. In thought, WNSO Team also with you on your special day. Edited by Sujita Lamichhane, 22 November 2003 - 02:07 PM. Today, WNSOs member Naaz ji is celebrating her Birth Day !! WNSO wishing to you on your birth-day for your very very brigt future. The whole team of WNSO from all around is sending to you many many well wishes on your very special day......HAPPY BIRTH DAY to you. May all your sweet dreams come true on your birth-day. Edited by Sujita Lamichhane, 22 November 2003 - 02:09 PM. On behalf of the WNSO Team, I wish to you is that today will be very happy and and the beginning of more to come. May your Birth Day be filled with Happiness, lots of Joys and Fun !! Happy Birth-Day to you !! And I personally wishing you on your birth day in the deep relation of same school Laboratory Secondary Boarding School. Didi, God bless you on your birth day and this day will bring to you your every happiness in your further life. On this day, I m praying for your very bright future. Happy birth day to you big sister. 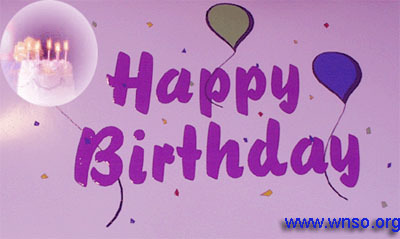 Today, WNSOs member ShahiGoura is celebrating his/her Birth Day !! The whole WNSO Team (WNSO family) is wishing to you with all the warmest and best wishes on your very special day (your birth day), today. May your Birth Day be filled with Happiness, lots of Joys and Fun !! Happy Birth-Day to you !! And on your birth day, a small request to you personally by me is, tapai dherai lamo samay dekhi chautarima nadekhieko thaha bhayo. Asha garchhu tapai afno Birth Day CAKE liera chhittai hami kaha chautari ma aunu hunechha. Tapaiko pratichha ma WNSO Pariwar. The whole family of wnso wish to You in the occasion of Happy birth day and also in the days to come. And will be very happy more than in the beginning. May all your sweet dreams come true on your very special day. Edited by RawalSB, 20 November 2003 - 07:36 AM. Suman bro.. HAPPY BIRTHDAY hai..
cake kaataane hoina? eklai eklai ho ki kya ho.. cake share garnu paryo..
Today, Wnso member shahilaxmi is celebrating her birthday. Have full enjoy on your birth day. Edited by Sujita Lamichhane, 22 November 2003 - 02:11 PM.